My edition: Paperback (proof), published on 2 July 2015 by Harper, 438 pages. Description: Gigi, Bette, and June, three top students at an exclusive Manhattan ballet school, have seen their fair share of drama. Free-spirited new girl Gigi just wants to dance—but the very act might kill her. Privileged New Yorker Bette's desire to escape the shadow of her ballet star sister brings out a dangerous edge in her. And perfectionist June needs to land a lead role this year or her controlling mother will put an end to her dancing dreams forever. After How to Be Bad, this is coincidentally the second young adult novel I've read in as many weeks, which is written by multiple authors – and again this was completely unnoticeable in the structure and pace of the book, so massive kudos to Sona Charaipotra and Dhonielle Clayton for creating a consistent tone of voice across the entire story. Though the novel follows an entire class of students, there are three talented girls in particular that shine throughout; Bette, Gigi and June. Bette is the darling of the school, a long-term student with a legacy sister she is destined to follow in the footsteps of. Gigi is the new kid in town and already has made such an impact on the teachers that she is cast in one lead role after the other. And June has an immense drive to prove that she is good enough to get a major role, even if her mother doesn't believe in her talent and can't see the beauty of the ballet because of own complicated past as a dancer. Beyond a few years of jazz ballet as a child I've never been particularly interested in this discipline and so it's a true testament to the writers of this novel that they made the world of leotards and tutus so incredibly compelling and suspenseful that I was barely able to put the (rather hefty) book down because I felt the desperate need to know what would happen next. It was somewhat of a disappointment then that the eventual conclusion did not give the feeling of satisfaction I had imagined it to. Instead the abrupt ending made it seem like an unfinished story; neatly setting up a future instalment, perhaps, but whole unsatisfactory to a reader who has spend 438 pages and many hours engrossed in a story expecting a gratifying pay-off. It is a shame that the young adult genre has become so over-reliant on splitting stories into multiple novels just for the sake of it as more often than not a single book can be much more concise and compelling, without risking losing the audience along the way. 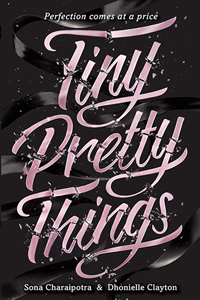 Nonetheless, I have to say that Tiny Pretty Things was a fantastically written and incredibly engrossing read (up until that ending, that is). If you can pick up both this novel and its inevitable sequel together and spend a (rainy) weekend losing yourself completely in the world of the ballet then I highly recommend you do so. It's mysterious, enticing and will give you an unexpected appreciation for the incredible discipline and dedication of the dancers training to become the next big (pretty) thing - no matter the cost.